Word is a powerful, word processing tool. The instructional videos below will teach you how to make working in Word much more effective. You can also check out this Quick Start Guide about Word 2016. Read the user support page about how to download UiT's Word templates to your personal computer and how to access them directly from Word from UiT's computers. Word has different ways of presenting the text in your document. Most of the time, you will probably use Print Layout. When using Print Layout, you should turn on the Navigation Pane, as it helps you organize your document, make adjustments, and has advanced search functions. Turn on the Navigation Pane by going to the View tab and marking the checkbox for Navigation Pane (in the Show group of icons). To turn on the Navigaation Pane, open the View tab and select the box next to Navigation Pane. 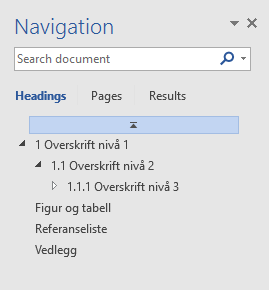 Use the Navigation Pane to jump from chapter to chapter in your document by clicking on the title. You can change the order of the chapters by using drag and drop. The numbering will be automatically updated. The Navigation Pane include a search box with advanced functions. Click on the little triangle. The most important thing you can learn in Word is how to use styles, especially for fomatting headings. By using styles you avoid manual formatting changes, and you can use many automatic functions, e.g. creating a table of contents. In order to work effectively in Word you have to use Styles for headings and more. Content in the Navigation Pane is based on styles. Practice adding numbered and non-numbered headings to your document. Word can automatically number your headings and subheadings, provided that you have used the heading styles in Word (Heading 1, Heading 2, etc). For example, you can set it up so that main chapters are numbered 1, 2, 3, and subchapters are numbered 1.1, 1.2, 1.3, etc. The UiT template for student assignements includes styles for numbered and unnumbered headings. You can remove numbering from a heading manually by placing the cursor in the heading and clicking the Numbering button. Even if your document is over 100 pages long, with just a few clicks of your mouse you can create a table of contents - provided you've used styles to denote where each chapter and subchapter starts. Text that has been marked as Heading 1, Heading 2, and all the way down to Heading 9 will automatically be added to your table of contents, along with the page number. To update a table of contents, click inside the table and then choose Update table. To create a table of contents, open the References tab and click Table of Contents. You can add captions to tables and figures by using the reference tools in Word. By doing so, tables and figures will be automatically numbered. In addition you can automatically generate a list of all your tables and figures, as well as the page on which they can be found. To add a caption to a figure or table, start by selecting the figure/table. Open the References tab. Click Insert Caption. Check that the Label is correct. If you have used captions on the pictures in your document, Word can generate a list of the figures or tables and which page they are on. See section 7 on this page for how to add captions to your figures and tables. If you have used captions to describe your figures and tables you can generate lists to supplement your table of contents. To update all lists of figures/tables as well as the table of contents, select the entire document (CTRL A or choose the Select button in the Home tab). Right-click the table of contents or a list of tables/figures. Choose Update field. To make a new list of tables or figures, open the References tab. Then choose Insert Table of Figures. Word has a gallery of preformated cover pages. You can choose a coverpage from the gallery and add your own text. A cover page will always be placed in as the first page in your document. You can reuse your own cover page by adding it to the gallery. To add a cover page to your document, open the Insert tab. Click Cover Page and choose the one you want. UiT has its own cover pages with the UiT logo. You can save these to the cover page gallery in Word so that you can add them to your assignments and more. You can download cover page templates for students from uit.no/studenter/oppgaveskriving. Filter based on which department you study at, language, and that you want to download a cover page. When you have downloaded a cover page, you can save it in Word so that you can add it to other documents later. Open the cover page in Word. Select the entire cover page (CTRL A). Open the Insert tab and choose Cover Page. Then click Save Selection to Cover Page Gallery. Make sure that the cover page is saved in a file called Building Blocks. When you want, for example, a heading to start at the top of a page, you should use a page break. That way, regardless of later edits to the document, the heading will always be at the top of a page. Do not use the Enter key to move content to the start of the next page. Instead use page breaks. To add a page break place the cursor at the start of the line you will move to the next page. Open the Insert tab and click Page Break. The first part of this video will show you how to add normal page numbers to your entire document. Then we’ll look at how to put Roman numerals on the introductory pages of the document and have normal page numbers throughout the rest. To add page numbers, start by double clicking at the bottom of a page to open the footer. This opens the Design tab. Click Page Numbers and choose to place the page numbers in the middle at the bottom of each page. If you would like to have two different kinds of page numbers (e.g. Roman numerals and then normal numbers) you need to add a section break. Open the Layout tab and click Breaks. Then choose Next Page under Section Break. Right-click the page number whose format you want to change. Choose Format Page Numbers. Choose the type of page numbers you want. You can change which number page numbers start at. Right-click the page number and choose Format Page Numbers. Choose Start at and the desired number (normally 1). When you copy text from other sources (e.g. a website) and paste in your document you risk messing up the formatting. Instead you should use a special kind of paste called keep text only. To keep your document's formatting, use Keep Text Only when you paste tekst from other sources. Copy text from the source document/webpage/etc. 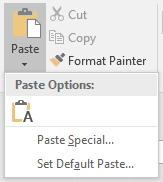 In Word, under the Home tab, click the little triangle next to Paste and choose Keep Text Only. A hyperlink is klikkable text that opens a webpage in your web browser. Your document will be much more readable if you hide URLs behind a descriptive tekst. Write a descriptive text (e.g. UiT homepage). Select the text and open the Insert tab. Click Hyperlink. Add the URL to the Address field and click OK.
A cross-reference is a link within the same document, for exampel to refer to chapter 3 for more information about a topic. Cross-references are clickable and can be automatically updated if you, for example, change the number or name of a chapter. Cross-references are links to other parts of the same document. For example "See Appendix A for more information." To make a cross-reference start by opening the References tab. Click Cross-reference. Footnotes are comments at the bottom of the page that can be used for supplementary information or citing references. Endnotes have the same function but are gathered all together at the end of the document. Footnotes can be used to add an extra explanatory text or citation. Place the cursor where you want to add the footnote. Open the References tab and click Insert Footnote. It is standard for pages in a Word document to stand (be taller than they are wide). If you want to add a large table of data or have a landscape picture, you might want to turn one or more pages on their side. To add one or more landscape pages in the middle of your document, you will need two section breaks. Open the Layout tab. Click Breaks and then choose Next Page. Repeat. Place the cursor between the two section breaks. Under the Layout tab, choose Orientation and then Landscape. You can use fields to automatically add the title of each chapter to the header in your document. Accessibility is about making technical changes that make documents readable for a blind person, for example. Universal design is about writing understandable, a clear document structure, and more. Everyone benefits from your documents being universally designed. This tutorial is about how to make good (read: universally designed) Word documents. This tutorial requires that you have made a universally designed document and want to convert it to a PDF. Your document should already be well written, have a clear structure, etc. That is why we will now focus on the technical steps for making the document accessible in PDF format. The starting point for this tutorial is that you have used Microsoft Word 2013 to write your document and want to distribute it as a PDF. The tutorial will show you how to export from Word to PDF. Afterwards you will use Adobe Acrobat XI to adjust the PDF to make it accessible for screen readers and more.